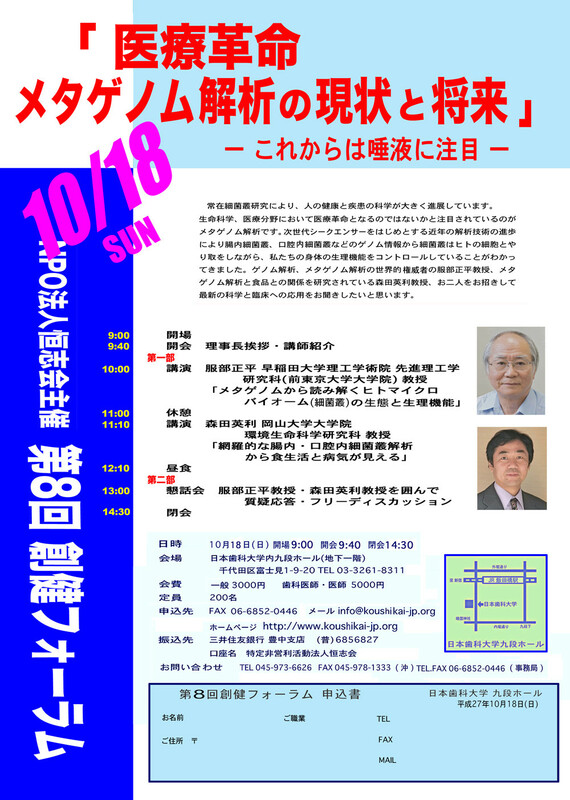 No.1 Commemorative forum of the publication of "Root Canal Cover-Up"
Thinking about focal infection "Cavity and a disease"
Modern people are exposed to various stresses on both mind and body. Either stress gives a burden to immunity, and the cavity gives burden to immunity also. Have you known that even if cavity is treated, and the pain is gone? The problem has not been solved. The mouth can be called an organ reflecting the whole body. 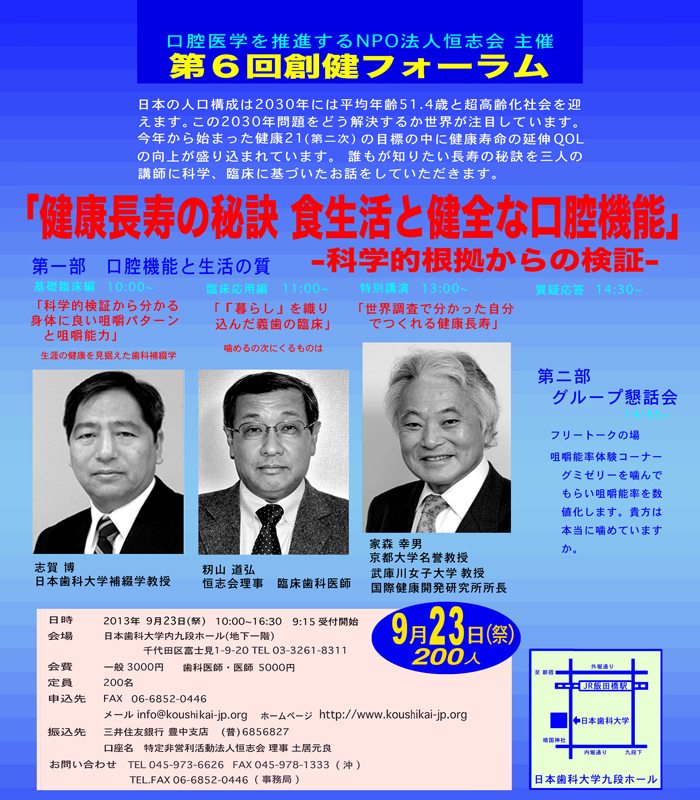 In commemoration of the publication of the book of "Root Canal Cover-Up", we have planned a lecture and symposium for easily understood by general people presented by researchers and others who have studied "focal infection" for many years, and have sounded an alarm. Let's think about this serious theme that did not appear on the surface until now. "Nutrition and the physical degeneration" was published aiming the health of life including the whole medicine, food, and agriculture. Furthermore, there are reactions from the medicine and dentistry world after the publication of "Root Canal Cover-Up" within one year, and the information of relation of various diseases of mouth, tooth and the whole body is brought up. Through the real cases presented by doctors and the dentists was relating to active clinical practices, we have investigated the direction of the future medical improvement and the increase of health based on the relations of the disease of tooth, mouth and the disease of the whole body. When you continue mouth respiration chronically, not only the morphological change of a face and the alignment of teeth but also the adverse effects to a whole body occur. "Why does mouth respiration cause a problem?" "What kind of relation does it have with the disease of the whole body?" "Can you change the mouth respiration that has become a custom to nose breathing?" 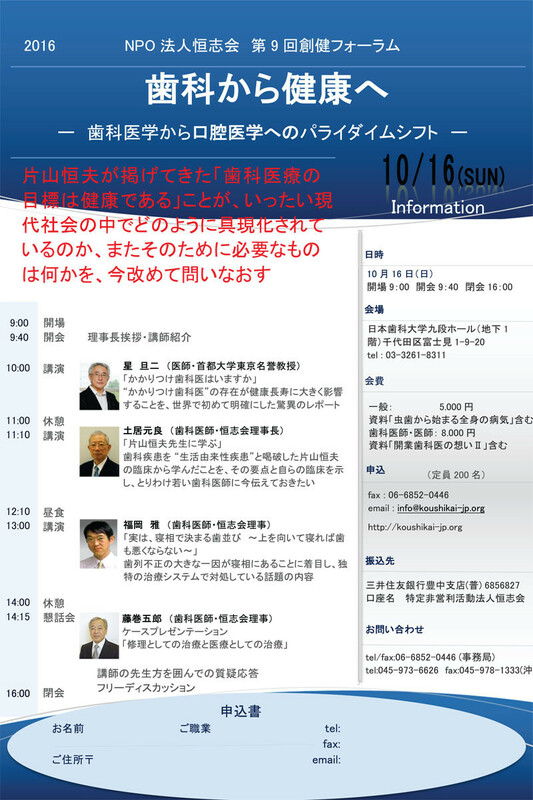 Four specialists of dentistry and medicine will give lectures. You can talk with each lecturer around table after the lecture freely. There is no other time than now, when the role of the oral cavity and the health of the whole body is attracting attention as now. A paradigm of dentistry is changing to oral medicine for sure. "What are bad effects of mouth respiration?" "How could I prevent it?" "What should I be careful in daily living habit in life?" "How do you put in practice clinically?" No.5 What should I do as a person involved in medicine? When power of inner healing (source of the life energy) is activated, the person comes to completely receive beauty and wonder of the life, and true health begins to breathe. Although it is revealed that an intraoral disease is intimately related with whole body, there is little study and approach in the field of dentistry, and the evidence is not made apparent yet. In hope for the further studies of dentists and I think educational organizations are needed in the future. As the result of these attempts, and systematic the future of dentistry could be built newly. It gives a new direction of dentistry in the future to changing from subjective evaluation to scientific and objective evaluation, while it has often been influenced by the study and the quality of the specialty, in other words, apprenticeship-like technique in the past dentistry. In the past dentistry, at formality was regarded important tended to assume all if form was regulated well. However, we may not solve the problem if we do not turn our consciousness to existing lifestyle, and child care, the environment including the growth behind intraoral various symptoms and illness to develop in a growth process. In our body, constancy must be kept while feeding back by an antagonistic system of the muscle balance, and adjusting it. Therefore, I think that big viewpoints of neurophysiology are necessary to handle in the oral cavity. A device detecting the activation of the cranial nerve domain controlling the excellent unpleasantness of the frontal lobe was used this time by adjustment work for the crown restoration, but because it detects only high occlusion, it is not much effective. However, if the pleasantness and unpleasantness under the consciousness is detectable, I think that this device can become epoch-making. Up until now, the checking of the occlusion of crown restoration and the denture has been performed using an extremely thin articulating paper mainly, but it is based on empirical technique and tends to be lacking in objectivity. 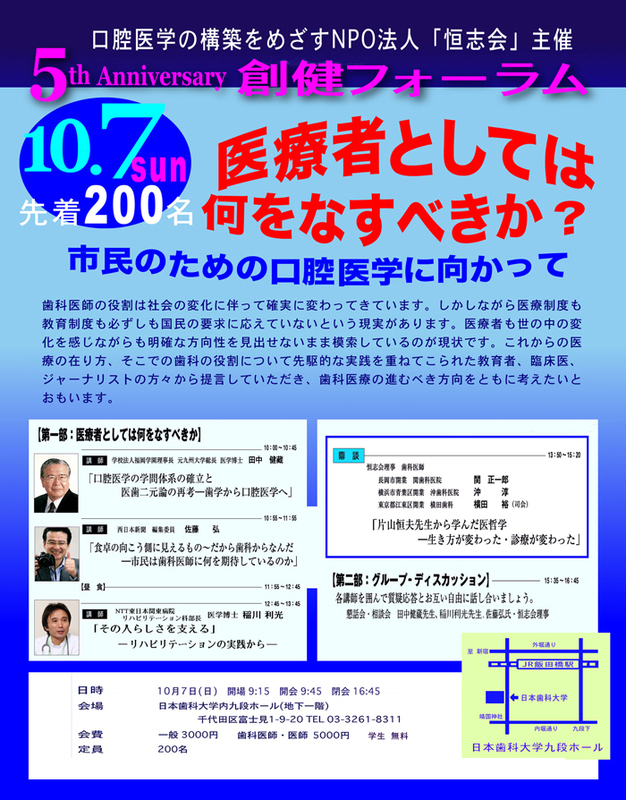 It must be desirable to become study the medical care based on scientific data and information of brain and nerve. As the device uses chewing cycle, it is an exercise of associated organizations which are approximately equal to real chewing. Therefore unknown information until now may be more likely to be provided. I think that we must consider oral medicine in scientifically corresponding brain function in the future. The Katayama seminar (seminar of 30 hours for four days in total) began in 1981was held 30 times in total, and was completed in 1996. Fortunately, the valuable lectures were recorded in videos. Meetings to see those videos were already held over four times till 2006. The sound of video is surprisingly good, and photographs over 1,600 slides covering 30 cases are digitalized one by one moderately, and, it seems you are actually listening the lecture of Dr. Katayama really. The people participated for the first time talked about an impression that they never had seen such a great thinker in the world of dentistry. 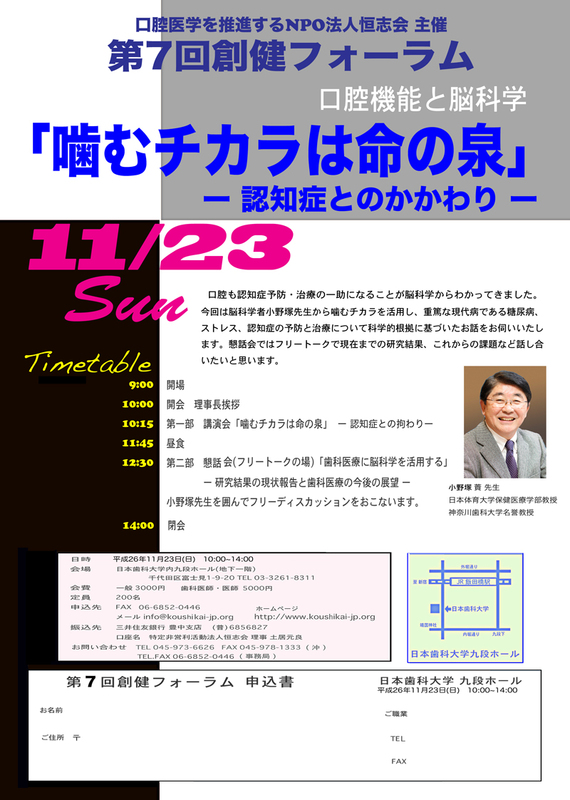 The lecture of Dr. Katayama talking about the true dentistry that nobody has taught him in the new viewpoints enthusiastically has not lost brightness regardless of the passing of time. And it reminds a participant of new impression and self-respect whenever it repeats the number of times.